Car travel training with your German Shepherd is very important because not every dog is a born car rider. Several problems may occur with your dog while traveling in the car. These problems are usually the result of stress or anxiety - especially if your dog is scared or is not used to being inside a car while the engine is running. Any kind of car travel with your dog may also be a problem if you have a high strung dog who can't sit still for a long period of time or if he has associated any kind of negative experiences while traveling in the car. One good idea is to associate all travel (at least while car travel training is taking place) with short journeys that end somewhere your dog really enjoys such as the dog park for example. It is also important that while doing this training that the journey lengths increase slowly over a period of time. A dog car harness is a really good item to have for all dogs that ride inside your car - they keep the dog in one location instead of moving all over the car. Also, not all dogs are born car riders so don't forget this. Motion sickness and many other anxieties can crop up if proper car training is taken for granted, making the problem just that more intense for the dog (and owner, too). If you have any kind of problems getting your dog to step up into, and to stay inside the car, the following suggestions may help alleviate your dogs fear . You want to make the car travel experience fun for the both of you - especially to make it easier for any kind of travel you may need to make in the future. For best results you need to practice all the steps below several times before going on any trips. This will help make it so much easier in the future when you want to travel with a German Shepherd, or any kind of dog for that matter. 1. Open the back seat and place your dog inside the car - while the car is parked in the driveway, doors are open, and the engine is off. 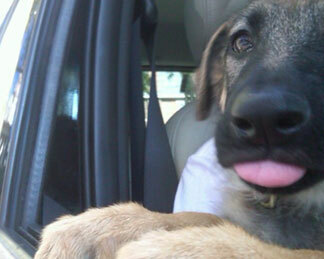 Let the dog spend some time in the car, supervised by you, with either a snack, dog chews, or a toy to play with. Praise him enthusiastically for staying in the car (and not freaking out). The chew bone, or the toy that you placed in there will help to create a positive experience for him, which will make the car ride stress free. Very important: avoid keeping your dog inside the car for too long in hot weather! Repeat this several times over several days before going on a trip - especially if your dog is nervous. 2. Once your dog is comfortable being in the car with doors open, then close the door (with the windows rolled down and engine still off) and get into the drivers seat. Stay there for a minute or so and allow your dog to get used to the car door being closed. Repeat this several times over several days before going on a trip - especially if your dog is nervous. If your dog is comfortable at this stage you can also start the car once in a while while sitting there to get him accustomed to the engine sound. 3. Lastly, put the dog into the car and take him for a short ride around the block. Leave his chew bone and toy inside the car to keep him occupied. After the short trip, make sure that you give him a good treat, praise him enthusiastically and repeat the process over the next few days. As your dogs comfort level rises, you can also adjust the length of the trip, making them just a bit longer each time. In time you can increase the distances. Take it slow in the beginning, train your dog slowly and be patient. You want to avoid all the anxiety , motion sickness and other negatives associated with car travel. If you can associate car travel training with something fun and positive you will complete this process much quicker and will have better results overall. Happy driving.